By most people’s standards, the above image will look a bit… ugly. 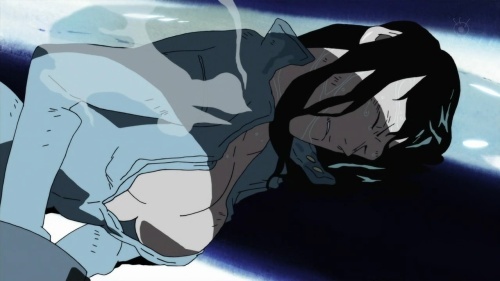 It was snapped from episode 455 of One Piece, but, the thing is, I thought this episode was beautiful; beautifully animated, that is. The above is merely 1 frame in a sequence of animation depicting an old lady weeping. Her face changes its expression a lot in just this one scene, and while it may not look pretty, it’s the movement of the animation itself that conveys her emotion. 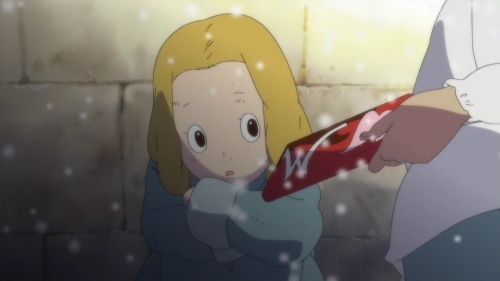 The animator, or sakuga, in charge (director) of this episode was Naoki Tate. He’s well known amongst One Piece fans as being a love or hate him kind of guy. Many tend to reject his aesthetic as too sketchy and strange in comparison to the typical One Piece style, some even misconstrue his episodes as low budget because they see the sketchiness and automatically assume it’s down to a lack of drawing talent. Suffice to say, that’s complete and utter nonsense. People are free to express their opinions, but images like the above have nothing to do with a lack of talent. They are stylistic choices on the part of Naoki Tate. Stylistic choices I happen to really admire. It’s an anime original (I loathe the word filler, especially since One Piece‘s so-called filler episodes tend to be fantastic,) therefore, he’s been given an almost free reign to craft his own thing and the result is more akin to a dark fairy tale than the typically bright and breezy One Piece. 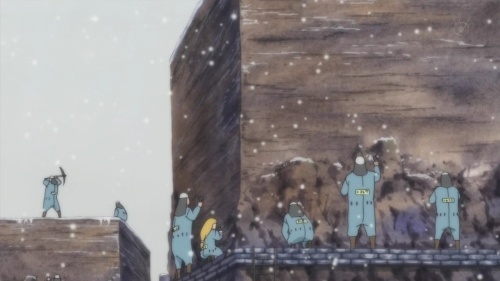 It looks really cold and it’s always snowing; one can feel the hardness of the rock, the way a smash of a hammer would reverberate up a frozen hand; the sky, grey and endless; the structure being built lacks any sense of design, it’s just dull and time-consuming. This is their life as prisoners, everyone wearing the same washed-out uniforms. It just feels hopeless. It’s lovely, then, how the tables are turned. Amidst such despair, beauty prevails. Be it in the soft, ever falling of snow, the golden lanterns casting shadows against the concrete walls, or the way the moonlight defies the night. There is a sense of life to be felt; a real, honest human touch, that’s warming to the heart. This is why anime remains so exciting to me. One can replicate a story, a line of dialogue, a joke, but the sense of soul embedded within every frame of this episode, within the movement itself, can never be replicated. This looks nothing like the One Piece I remember watching when I was younger (before I dropped it). Wow. It reminds me of the art from some episodes of TTGL, really. Anime adaptations should do more than just reproduce (money! ), it should aspire to be divine creative force. Totally! 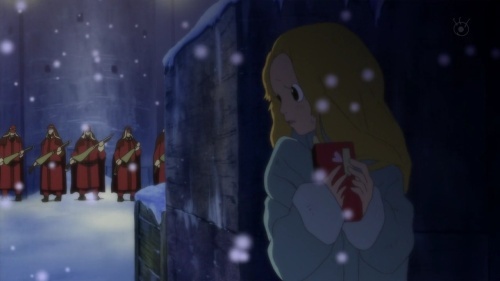 Anime has very much a different feeling when it’s aspiring to be something; and it makes me glad to be a blogger, because in these cases, just writing about it becomes a pleasure. In some cases it does look like the usual sacrifice art for good animation, ala the top screen looks real rough. But such trade-offs help create fluid movements which are sometimes necessary in comparison to detailed art. But the last screen looks amazing, if it moves as good as it looks then wow. I’ve never considered One Piece visually beautiful but this is too visually stimulating to ignore. 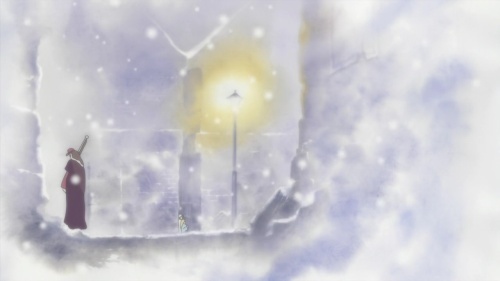 The color composition in the snowy landscapes are indeed breezy and fairytale like, unlike One Piece’s brash and rough design. Funny how Filler-episodes have such a negative connotation, when they can be this riveting. I blame Naruto for all the hysteria over filler, and, to be fair, Naruto filler is generally pretty awful. I remember there being a lot of criticism aimed at the FMA: Brotherhood anime adaptation for not being a page for page replica, but that turned out just fine (well, better than just fine!) It’s often easy to spot when anime like this gets made; it’s not just that it looks different, but there’s a very palpable sense of spirit. Intuitively, it just feels like it’s trying to be something, or, like gaguri said above, it’s aspiring. I hope that came across in the images I selected, at least. On the note of One Piece ‘filler’: I think I mentioned this in my post, but the filler/originals are really a world within themselves. Actually, just about everywhere I’ve gone in Japan thus far I’ve seen Chopperman souvenirs – One Piece in general, as well, but the Chopperman cell phone charms seem to outnumber them by far! Great post. I’d love to check the episode out. I find the love/hate reaction of Naoki Tate a little baffling, because frankly, I think he’s the one animator that is ironically the most adept in keeping the One Piece spirit through while actually having his own style. One of the reasons being the way he portrays movement is something I’d even imagine Oda himself would picture his characters moving, rather than the usual stiff animation that simply imitates drawings off the book. Totally agree. I can’t really work out if fans hate anime when it’s actually being animated, or if they just prefer a consistent style? I remember seeing somewhere that, when compared side by side, Tate’s style actually looks more like Oda’s drawings than the typical look of the anime anyway!